One of the indisputable strengths of Google's Android Auto platform versus Apple's CarPlay is the simple fact that you don't explicitly need a compatible vehicle in order to use it. See, you can actually use your smartphone as a dedicated, fairly distraction-free smart interface dashboard for you device that gives you easy access to Google Maps, Spotify, Play Music, and most importantly, the Google Assistant itself. The requirements? Any relatively contemporary phone that's running Android 5.0 or newer, preferably a car stereo with Bluetooth, and a handy phone mount for your car. That's all it takes, no USB cables and whatnot are required for the task. To summarize it all, Android Auto is a great solution bringing Google-powered navigation and your favorite music playlists to your car without the potentially distracting interface of Android itself. You get larger, simplified menus, integration with core phone functions, and less-distracting text notifications. Best thing, however, is Android Auto's protection - if you use it too much for a short period of time, it will automatically disable itself for a while, urging you to keep your eyes on the road. There are tons of apps that work quite well with Android Auto already, but as usual with anything Android-related, the selection is super big. Nauseatingly big, even. So, we decided to sift out some of the best Android Auto apps that could brighten up your daily commute while maintaining a distraction-free atmosphere. In case you're driving some older wheels or simply can't enjoy the sound of a V8 engine, your single entertainment during longer rides is most certainly music. Here are the best music-streaming apps that seamlessly work with Android Auto and flaunt simplified car mode interfaces. Note that all of them are similarly-styled, with the only differences being a couple of colors here and there as well as the items in the overflow menu, housing your music library and playlists. 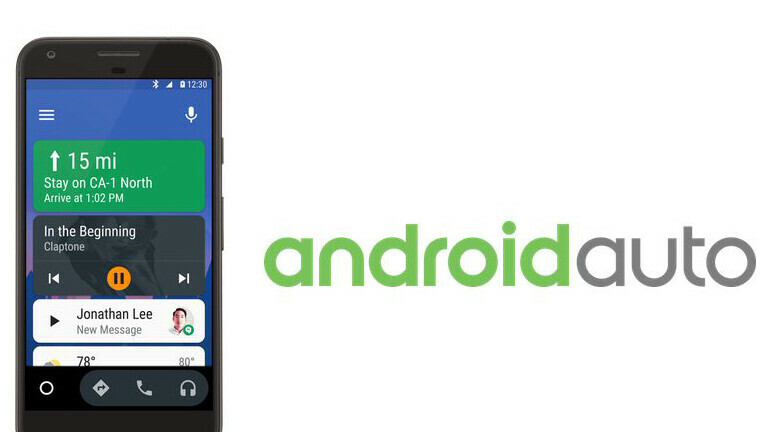 One of the most-popular music streaming services out there integrates beautifully with Android Auto. From the get-go, you are presented with an interface that requires a bit of getting used to, which is bad if you're driving, but once you master it, you will be able to navigate through your playlists without even looking at your device. We recommend familiarizing yourself with the interface while stopped. Have in mind you won't be able to look for new music when the app is in Android Auto mode - all you get are your own and Spotify's numerous stations and radio playlists, which is not bad at all! Even if you are not a Google Play Music subscriber, it's worth having this one around due to the simple fact that it's one of the few music apps that lets you play local audio through Android Auto. Needless to say, that's great news for people on tight data plans. Of course, Google's enormous music library is another great thing to have, if you're a paying subscriber, of course! VLC can be used to exclusively play music you got on your device regardless of the audio format. If you've never outgrown the good ol' days of MP3 hoarding, you’ll be able to use VLC as your travel music player with easy browsing into you audio library, with the minimum possible distraction from driving. Just don't expect video playback support. Have in mind that you might have trouble making VLC work with Android Auto as recent updates have broken the funcitonality. We fixed a similar issue of ours by rolling back to VLC v.3.0.4, you can find it on the APK repositories. An alternative to Spotify and Google Play Music, Amazon Music offers a similar itnerface to just about any other audio app. Of course, it requires a paying subscription or an Amazon Prime account. Alexa is sadly not available through the Android Auto interface. Loving Deezer? No need to switch to another service to enjoy it while driving, the app is supported by Android Auto, bringing all of your curated playlists and music. Okay, why listen to music when you can entertain yourselves other ways and even learn a thing or two while doing that? Podcast apps are a grand staple of the Android Auto experience and deserve their own gallery selection. Boasting the same general interface as music apps, the only differences are hidden into the overflow menu and, of course, your content. Possibly the most popular item on this list, this one is often lauded for its super-intuitive interface. While all podcasts app are forced to conform to the same interface in Android Auto mode, you're still quite likely to use PocketCasts if you've grown accustomed to it. A superb podcast client for Android with great Android Auto integration. Probably the most fleshed-out podcast client for Android. Great selection of series. Podcast Addict is another great app to try out. One of the main strengths of Anchor as a standalone app is the fact it allows you to record and edit your own podcast on the fly, but sadly, this superb feature is missing from its Android Auto version. Still, it's a pretty great podcast player. Thanks to the wondrous magic of technology, you no longer need to read books, you can simply listen to them while you're commuting! Or, you know, you could just listen to a particular radio station by simply installing its app. There's a slew of apps for Android Auto that let you do just that, here are our favorites. Amazon-owned Audible is possible the most popular audio book service right now, and as such, it's our go-to recommendation for listening to audio books with your Android Auto app. Another great audiobook app that has a great selection of free books should subscription models not be your thing. If Internet radio is your thing, TuneIn Radio is one of your best bets. Aside from listening to radio and NFL, MLB games, you can also use it to listen to select podcasts. Video game soundtracks are created with the sole purpose of sucking you into the game and creating a deeper, more profound experience as they help with concentration. However, these can perfectly complement just about any experience, driving included. Still waiting until they open up the nav part of Android Auto. Currently, only Google & Waze are allowed. Android Auto and Apple CarPlay should come standard in all new cars. The proprietary navigation systems from almost every car manufacturer are horrendous. Reason I brought a VW Golf. Does Podcast Addict work for Android Auto?